It's New Years Eve. May yours be happy and safe, and our best wishes for 2009. As tonight ends the old year, I find myself reflecting on times past, both good and not so good, earmarked by the nights that defined and provided closure to years, decades, and even centuries. As we look forward to the change that tomorrow will herald, let us give thanks for our blessings and bid farewell to those things we would happily discard. The new year will be what we make of it and here's to Auld Lang Syne. 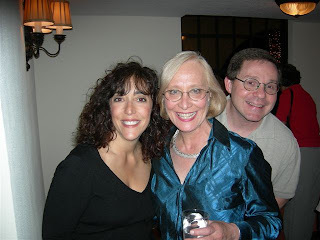 From my twenties to several years into my fourth decade I did not like New Years Eve. 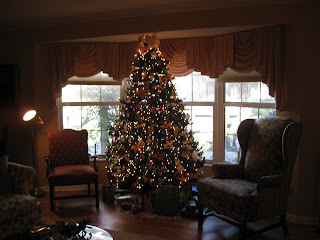 Each year, as Christmas gave center stage to Auld Lang Syne, I tried to shrug off the gloom . "Another year gone," I would say to myself. "Another year of life past with no particular achievements to show for it." I would sigh, shrug, and go out to dinner. Resolutions unfufilled, I wondered just what it was I was supposed to be doing and accomplishing, but the answers never came. I haven't felt that way in a long time. Since way back in the 20th century in fact. Now, I look forward to the New Year and the adventures it may bring while saluting the recent past. This year is no exception. Personally, I've been lucky in 2008...and I count my blessings. Thanks to an inheritance, I was able to pay off my house and all my debt. I welcomed my first grandchild into the world and enjoyed the birth of Danny's first step grandchild. I published my third book. And, now that "Marley" is no longer alive, I have the world's worst dog! Here's to Chili. 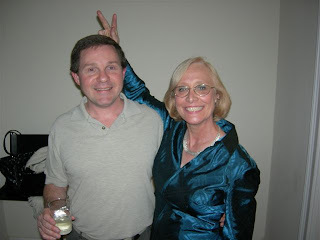 I look forward to 2009 which will herald Danny and my 7th happy year together, bring a new son-in-law into the family on January 3rd, a grand daughter in April, a new and hopefully better era in Washington DC, and...well...who knows what other adventures yet unfortold? Now undeniably, this year, 2008, has been a bad one for most people. I keep hearing folks say, "I won't be sorry to say good bye to 2008." Well, they have good reason. Horrible weather disasters, global warming, terrorism, war. Political scandels and business double crosses. And we all know what a crappy year it has been financially for most of us in America. People out of work who can't get new jobs due to hiring freezes and companies going belly up each day. Massive credit debt. Houses lost to forclosure. People getting sick with no health insurance. Stocks plummeting and retirement savings trickling away like sand in an hourglass. Locally, we've seen all the same problems as anyone else in our benighted country as well as increasing crime such as the horrific murders of a lovely young graduate student at UCF and the senseless murder and subsequent cover up of the murder of little Kaylee Anthony. Yeah, good bye and good riddance to 2008. This morning, for some reason, I woke up trying to remember what I had done on the last dozen or so New Years Eves. While the required coffee was brewing, I sat down with pad and pencil at the kitchen table and numbered the years from 1994 t0 2008. That's actually 14 years, but I always like to set the bar a little higher when asking a lot of my memory. Just for practice and also since those were significant years in my 'life passages' folder. 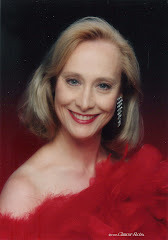 In 1994, I was separated with a divorce pending after several decades of being married. Color me then hopeful, happily adjusting to positive new experiences for the first time as a single adult while somewhat nervous about a financial future then uncertain. I remember spending New Years at an incredibly crowded Universal Studios with my friends Joanie and Angelo. Despite waiting in lines for hours to ride Kong and Jaws and the appropriately named Back to the Future, we had a blast. At midnight, Joanie said, "Happy New Year, everything is going to get better and better from now on." Joanie was right. Each year after that, I learned new things, gained confidence in my abilities and talents, made new friends, helped in many ways to promote the arts in Central Florida, fundraised, and discovered a whole brave new world when I began to write poetry and fiction. I won't detail all the rest of the 20th century New Years Eves in order except to say that they were spent with friends at parties of one sort or another. Several were at Scottish Hogmany events. One year I went Sea World on a miserbly cold night with my kids and high school chum Shelley who recently returned to live here from Colorado. I almost didn't go to a party on New Years 1999 fearing that on the stroke of midnight, all civilized life would stop, and I might have to face a thirty minute walk alone in the dangerous dark to get home to my stranded dogs. Sounds pretty silly now, but the press kept telling us that all computers would stop and we would plunge back into the dark ages. I remember how we all waited with baited breath for something awful to happen at 12:01 and when nothing did, we shrugged and partied on. We had nothing to fear but fear itself. 2001 was the first New Years I spent Home Alone. I dreaded the night, but discovered it actually wasn't so bad. I made myself a steak dinner, watched rental DVD's and walked dogs. Nothing to fear but fear itself again. I thought my New Years might be like 2oo1 for the duration but I was wrong and once again Joanie's prediction was correct. 2002 was the first New Years I spent with Danny. The new century has been pretty great, at least on a personal level. Bring on 2009. I believe its just going to keep getting better. Ta. Live long and prosper. Ho ho ho, Merry Christmas from our house to yours. What did you do on the big holiday? 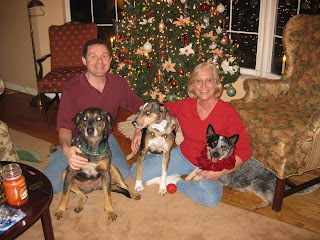 Last evening, Danny and I attended Christmas Eve services and watched several classic holiday films. (My fav: A Christmas Story). We made very merry today, first at Amy's house for breakfast and to watch Alex enjoy his first Christmas. Check out my flickr pix. for some of the photos. Then, after dog walkin' and naps, I made a roast beef and pork loin Christmas dinner for Danny n me, Laura and her very soon to be husband, Paul. Danny made mulled apple cider and he and I drank way too much but it was very good. Was "Santa" good to you? I got some way cool gifts, including but not limited to: a Digital Speaker System, which charges my iPhone, works with the iPod and plays all my music (from Danny), a dog agility training set (from Amy and Elias) and the object pictured with me in the second picture. 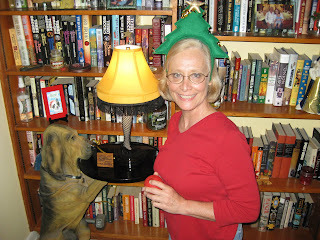 Yes, folks, my very own "Leg Lamp" as seen in my favorite Christmas movie mentioned above. This one was from laura and Paul. The best gift of all was being able to enjoy the holiday with family and talking via phone with absent but dear to our hearts family in Georgia and New York. Included, a Christmas poem . Peace, and good will to all. 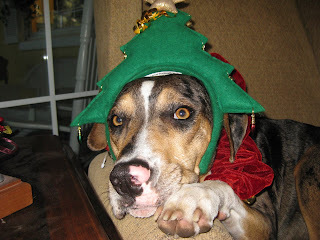 Santy Paws says, Merry Christmas, one and all. May no enemy smell you out, may the squirrels be slow, may the road rise up to meet you and lead you to new adventures, and may meaty bones fall from the sky. Or whatever jingles your bells. Bark the Herald Angels sing. Ta. Its almost Christmas. It is a Christmas off a different sort this year. Not so much Holly Jolly. More of a Blue Christmas. As I drive around town, I see less red, green, and white lights shining merrily in people's yards than in past years. Too many houses are dark and empty looking and many yards have 'for sale' signs, some of which have been stuck in the ground for nearly two years now. There are no buyers. The storefront windows beckon the sparce crowds on the sidewalks with 50-70% off signs. At Lowe's the Christmas decor was completely gone last night as if Christmas itself was non existent. I don't think they sold out of trees and lights and blow up Santas. I read in this morning's paper that retailers are taking things off the shelf and selling to wholesalers for dollar stores and Big Lots type discounters. Desperation is in the air instead of roasting chestnuts. I hear no silver bells or any other kind. The charity bells ringers are gone, too. My own shopping habits are different than in past years. I haven't bought anything in a department store in longer than I can remember. Generally I shop in Target or Ikea or yes, I admit it, Wall mart and K Mart. As far as I can tell, so does pretty much everyone else I know. I wish the money would go directly to American business instead of China but at least the stores employ local folks and benefits the economy indirectly...somehow...I think. These are tough times: the worst since the great Depression of the 1930s. We all know that. Over a half million people in my own state are out of work. Job hiring is frozen in most places. Folks are uninsured. People who have saved are watching their 401Ks and stocks tank day by day. Nobody can sell their houses. Many have faced or are facing imminent foreclosure. We are angry that big business bankers and CEOs got government bucks for running the economy of the county nearly into the ground itself when the middle class can't make it and the poor get poorer. Many of us hope the new administration in Washington can halt the disaster and get us on the road to recovery. The Christmas message is one of hope. We must embrace that message. What else can we do? Thankfully, due to a little inheritance from my parents I am in better shape than most folks right now although I know that financial security (and indeed life itself) is never really a sure bet for anyone. Recently, I was given a not so welcome prediction that my future financial picture may not be as rosy. So, I asked myself, am I making responsible financial choices? Upon reflection, I think, yes, I am. I was able (thanks to my mother) to pay all my credit debts and pay off the mortgage on my house. I no longer use credit cards. I paid cash for necessary upgrades and repairs on my house and saved enough to buy a new roof and replumb when necessary. I have started a HSA and secured less expensive health insurance. I got rid of my luxury car and bought a much less expensive but good quality one I plan to keep a long time. I spend no money on travel. I spent a grand total of $300.00 on clothes for self in 2008. I invested in the stock market and in other areas recommended to me and put more money into my retirement funds. Unfortunately, that area isn't going well. But investing isn't going well for anyone else in America either, so I won't beat myself over the head for that. My only real indulgence, aside from buying books to read, is eating out several times a week ...and that at least does help the local economy. I do need to decrease my carbon footprint and be more aware of ways to 'go green'. That's one of my New Year's resolutions along with eating less fat, lifting weights and doing Yoga more times a week. Actually, these are good goals for everybody! Good health practices and take care of the planet too. As for the doom sayers and those who live their lives according to their moods which are usually gloomy( and which they usually try to infect everybody around them with), as well as surviving the crappy economy, I offer the Captain Jack Sparrow Philosophy, according to me. The key is adaption and optimism. Yes, Jack is a fictional character and yes he is a pirate. In his films, he doesn't stick to a plan but makes it all up as he goes along. But, he has something to teach. Jack is full of self reliance. Jack believes in Jack. Jack knows that if he depends on government or on friends to save him, he may get roasted by cannibals or hung by a foppish East India Company merchant snuffling snuff and clothed in velvet. Or a corrupt politician. Or scammed by another pirate. So, Jack assesses whatever situation the he is thrust into, doesn't panic, uses his brains, assumes that there is a solution, changes his behavior to effect a favorable to Jack outcome (which in the films usually involves staying alive , drinking rum, and getting away with some cash), and does it all with a bit of witty dialogue. The witty dialogue may be a bit of a stretch for many but the rest is doable. Yes, Jack is a pirate and his friends mostly assume he will let them down, but in fact, he never does. What he is really is, to put it in practical terms, is an individual who doesn't follow the company line. By the end of each of his films, Jack trips up the real villians, sets his friends free and exits smiling. One of my favorite Jack moments was when it seemed in his second film that Davy Jones would win and Jack's doom was assured as The Krakken climbed over the sinking ship to eat him, he lifted his sword, strode over to the monster and said with a smile, "Hello Beastie!" So yo ho me hearties, we have nothing to fear but fear itself.... and take that all ye Krakkens. Good old Jack. Confidence and self assurance, self reliance and the refusal to accept doom as inevitable, taking the initiative with attitude again. Okay, I heard that negative tut tutting. Is a fictional pirate any worse than a real businessman or stockbroker or your neighborhood banker or company CEO? I think not, so suspend your moral tut tuts. Jack ain't asking for no government bailouts after all. So,like Jack, I thumb my nose at predctions that we are all doomed. As Jack would say, "You shall always remember this as the day you almost captured Jack Sparrow." Or to put it another way, as Molly Brown who was a real person said while stepping on the life boat just before the Titanic sunk, "I ain't down yet." Enough analogy you say? Okay. I will close. There will always be Krakkens and there will always be Jacks to spit in their eyes. At least I hope so. So, let us enjoy Christmas in whatever ways we may. Bring on 2009. "Hello beastie." I hope that those who are having the toughest of times don't lose hope. And for those that are better off I ask you to make just one person smile today. Give what you can, whatever that may be. A hug, a letter, visit, a check, or even a joke. Ta. Finally, I post some pictures from our afternoon at FOT at Orlando Museum of Art. It was a great jump start into the season. 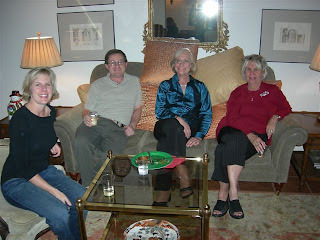 Picture number 2 is Danny's mom, Charlotte, and with me in the last photo is his sister, Robin. We always look forward to their annual holiday visit from Atlanta. Ta. The pictures tonight are from Downtown Disney/Pleasure Island where we celebrated Danny's birthday last night. 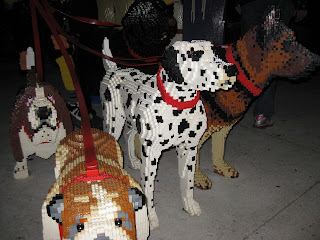 We ate spring rolls and pumpkin ravioli at Wolfgang Puck's and then shopped the shops and visited the Lego Dogs display (one of my favorites...go figure, eh?). 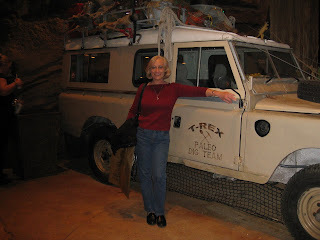 The picture of me with the jeep vehicle is in front of a new place called T Rex that has a giant, uh, T Rex just inside the restaurant that swings its head back and forth. The eatery itself is a bit like Rainforest Cafe, but 'dino cool' and there is a dig your own fossils pit for the kiddies. Fun. Great place to take little Alex, Gavin, and Bailey in a few years! By the way, Danny wouldn't let me take his picture but he doesn't look any older than last week at this time. I just have that one more elusive gift to find and then I am all ready for Christmas itself. Figured out (with a little advice from Palmer Electric) what went wrong with my outside holiday lighting display which is back, flashing merrily in all of its multicolored glory. Abby knocked over one of the smaller 4 ft. inside trees jumping at the window and now the lights won't work on that one. Arrgh! It was the dog ornaments tree. Appropriate, I guess. I have some spare light strings in the garage and I suppose, sigh, I can fix it. But I hate doing lights! Ah, the complexities of Christmas season. It's so good to have all my parties done and cleaned up. I enjoy them, but they are a whole heck of a lot of work, before and after. Glad I am my little padawans, that I now have a whole year before doing parties again. I am getting a little tired of eating the leftover party food too, except for the cookies! Well, it is almost Friday. Enjoy, silver bells, chestnuts roasting, holly jolly, let it snow someplace, wassail away me hearties for the year is drawing to a close. Ta for now. Some pictures today from out Art Festival party Wednesday evening. First, me an Danny with our good friend and superb cookie maker, Camille. In the second with Art Festival Co-president Linda and her lovely daughter Katie. The last one is of course the required donkey ears picture. My hostessing duties are over for this year, our personal Christmas party having happened last evening. It was friggin cold out...a real December night all right...but that was kinda good since it forced folks inside from their usual congregating poolside, so they finally got to see all my inside decorating efforts. Which are considerable. Beaming mom to be Laura and her Paul were immense help in setting up for the party and in bringing some extremely yummy dishes. Amy and Elias brought my cute lil grandson, the future Alex the pirate, for everyone to see. People enjoyed Alex. Alex did not enjoy people. The dogs proved to be popular in their garage hideway. If I'd known folks would want to go out there to see The Mutley Crew, I would have cleaned up better!! Oh well, 'tis done for another year. And it was great to see so many friends that I mean to see during the year and never quite get around to. Even if my hostessing doesn't let me talk long to anyone. Tonight, if Danny's first ever hangover lifts in time, we have the Knights Templar Christmas party. The only negative thing on my horizon (aside from all the $$$ gone from my retirement accounts thanks to the recession) is that I had two pretty scary nose bleeds last night. Out of nowhere for no discernable reason. I mean blood was gushing, dropping on the floor, soaking tissues, and scaring me half to death. For awhile I thought I might actually have to wake Amy up to take me to Emergency since Danny was snockered and couldn't drive. Finally the blood stopped, but I was afraid to fall asleep and stayed awake till three am. Then whenIi woke at seven thirty I was afraid to get up for fear the nosebleeds would start up again. My nose feels sore, like something is stuck in a nostril...but I will not blow it!! Well, ta for now. have a great week end. Tick tock, I'm on the clock. My books are here. Yes, you too can have your very own copy of my poems...and one to give for Christmas. That's Between The Lines, by me, Nancy Deutsch. Amazon.com will send one your way. If you prefer short stories, Flights of Nancy is still available as well. Newsflash: it makes a nice gift set all you Santa babies out there in Blogland. Ta for now. I'll try to post more before the Whos eat the roast beast and Olive the other Reindeer rides again. 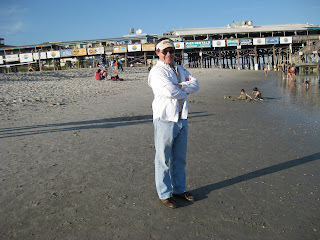 These photos are from Cocoa Beach last Friday. 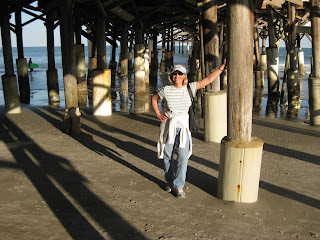 In the first, I am holding up the pier. In the second, Danny looks like he is waiting for something to a-pier. Notice that we are not dressed in swimming clothes: it was pretty cold by Florida standards so the only folks in the surf were the snowbirds. It was a great walk on the beach day though. After walking, we found a terrific Italian place to eat. Pricy but divine food, worth the hour drive alone. Backing up a little, Thanksgiving itself was great fun at pal Cheri's house with good food, good friends and their families. We wrote down all the things we were thankful for in 2008 and read our offerings to the group after dinner. We also wrote down bad things we wanted to be rid of and put them in the belly of artist Cheri's handcrafted "Burning Man" and burned him in a back yard bonfire. I wrote down losing 50K of retirement investments to the dang blame recession and spiders in the garage. Jumping forwards again, on Saturday, we holiday shopped all day at Ikea and Super Target. Just little old me, helping keep the economy afloat a little longer. 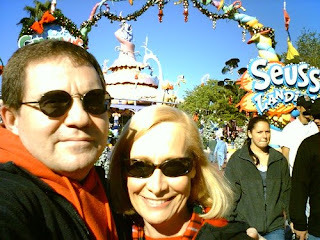 Sunday, we went to Sea World where we rode The Polar Express twice, visited the penguins, and caught the Pets Ahoy show. It rained buckets. We bought slickers and umbrellas and kept going.Then, we went home to decorate the house some more for you know what and watched the film The Polar Express. It took me a solid week, taking time out for the big week end, but I have finished the interior decoration. I am soo tired. Sigh. Still have to do the outside lights and...yuck, yuck, yuck, clean up the porch/pool area for the parties next week. I am halfway through my card list, have printed out all the Christmas letters for out of towners, sent out all the party invitations, paid the first part of the month bills, ordered presents for the out of town relatives, and got started on Christmas shopping. And, it just turned December 3rd fifteen minutes ago. So, I guess I am on schedule. Chili is sick again with yet another mystery illness that involves her peeing too much. Vet did tests yesterday with no definite results. The epilepsy meds may be making her drink too much. Its always something with Chili. Another rug bit the dust yesterday. Danny is suffering too, from another really bad gall bladder attack. But, he is soldiering on. Put an Ikea dresser for the 2nd guest room together for me tonight. Good Danny! The first 50 copies of my new book, Between The Lines, came today. I opened the cover on the first one at the top of the stack and it was my cover on somebody else's book! I just about but not quite freaked. Checked all the others and they were fine. My words on the pages. Mistakes happen I guess. Gonna check with the publisher tomorrow. I'm off to bed. Ta.